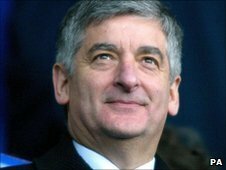 New Football Association chairman David Bernstein is set to bow to one of the government's demands for reform of football's governing body. He has written to members of the FA Council calling for the appointment of two independent directors to the board. Bernstein is set to act on the back of recent criticism of the FA. Last month the Sports Minister, Hugh Robertson, described the Football Association as "without a doubt, the worst governed sport in the country". In 2005, Lord Burns suggested the appointment of two independent directors in his report on the structures of the FA - but that recommendation has never been implemented. Lord Burns had argued that these two directors would be able break the deadlock between the professional game and the amateur game, both of which have five representatives on the FA board. Earlier this week the FA board unanimously backed Bernstein's plan to consult the FA Council about adding two independent directors to the board. And the Council would need to support any changes. Bernstein has written a letter to all 114 members of the Council. In it he says: "I am very aware that this issue has been discussed extensively in the past. "I recognise that, for some, this may be a controversial proposal. "That is why I am keen to engage with Council members in the coming weeks to discuss the merits of the proposal. So please, if any of you have any concerns on this matter do give me a call or email me." David Bernstein's intervention is timely, as a Commons Select Committee is currently looking into the governance of football - a key recommendation of which is likely to be the appointment of these two independent directors to the FA board. If the FA takes the decision itself, before the new chairman has even had to give evidence to the Select Committee, then Bernstein will be able to argue that he is already leading the Football Association on the path to some of the reforms which the government is demanding. No date has been set for when the FA Council will discuss Bernstein's proposal.